Life (and the Pursuit of Happiness)– But for How Long? Confronting our mortality is not an easy task for most people. However, there are many reasons people should consider just how long they might live. Differences in life expectancy between the rich and the poor can mean that more affluent Americans receive hundreds of thousands of dollars more in benefits that those who are less well off. In addition to the economic considerations, there is a psychological and perhaps even moral factor that comes into play when thinking about how long we might expect to live in relation to our financial status. Topic 3 in Fair Game? asked users to think about exactly this question and to estimate how income is related to life expectancy and what that relationship should be in a fair world. On the whole, our users estimated that the richest 10% of society would have a life expectancy 12 years longer than the poorest 10%. In reality, the difference is 11 years (12 additional years for men and 10.1 additional years for women). How many more years of life do they think the wealthy should expect in a fair world? 3 more years (a 75% reduction from their estimate of what is true). Estimates for the current difference in life expectancy were remarkably similar across all age groups, as were our users’ beliefs about what would be fair. Preferences for a fair difference were also similar. There may be hints of a difference between younger and older adults, with a possible explanation simply being ‘mortality salience’, or how much longer users themselves’ expect to live. What about gender? Both males and females estimate 12 more years of life for the top 10%. But they differ slightly in what they think a fair amount of additional years would be — 4 vs. 3, respectively. And political leaning? People who identify as conservative and those who identify as liberal only differed by 1 year in terms of what they believed the life expectancy gain from wealth to be, and 2 years in what they thought it should be in a fair world. Conservatives estimate the gain to be 12 years, while liberals put it at 13 years. In terms of what they think would happen in a fair society, conservatives consider 5 years and liberals consider 3 years to be a fair number of years gained with wealth. Despite these small differences, the presumed improvement (from what is thought to what it should be) ends up being 7 years for conservatives vs. 10 years for liberals. Together, the data reported here suggest that estimations of the present gap in life expectancy are fairly accurate. And that small differences in life expectancy (3-5 years) are considered fair (or perhaps tolerable) by most people. Has the wealth-based life expectancy gap always been this large? According to a Brookings report, it has actually grown from 4.5 years (for the cohort of seniors born in 1920) to 11 years (for the cohort born in 1940). It is likely that multiple factors, including differential access to quality medical care, and higher rates of smoking and obesity, contribute to the growth of this gap. On top of all of this, wealthier people typically retire later and can delay receiving social security payments, thereby increasing income inequality in the older population. Unfortunately, public benefits that were originally intended to be progressive seem to be becoming (unintentionally) regressive over time. Perhaps there are some solutions that might help to keep more Americans living long, happy, and healthy lives? What do you think? 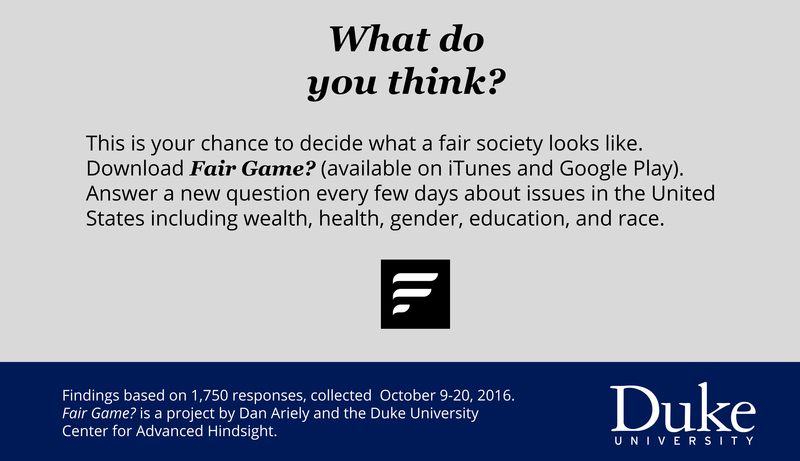 Please join us and play along by downloading Fair Game? from iTunes or Google Play.